Ultimately I enjoyed this book. As a story it has all the elements of an entertaining reading experience, and it is deserving of its status as a ‘classic’. In summary, it is slightly older, slightly weirder and slightly less well-known than George Orwell‘s 1984, but I compare the two because they both are dystopian novels. Huxley‘s vision of the future is, to the best of my knowledge, unique for it’s time, and a long time afterwards. It is a book with a bleak vision for the future of humanity. Much bleaker and more frightening than Orwell’s world of censorship and coercion and perpetual war, is Huxley’s vision of a population manufactured into castes, educated to desire, willingly drugged into compliance. This subversion of will is really what frightened me about ‘Brave New World‘, there is no way to resist when you are constructed from conception to comply. Although the population of 1984 were deceived through propaganda there was the (albeit very small) possibility of resistance. Aside from their prominent status as classic dystopian novels, part of the reason I draw so many comparisons between Orwell and Huxley is this comic. Stuart McMillen has interpreted a section of Neil Postman’s book ‘Amusing Ourselves to Death‘, and all of the text is a direct quote from the book. While I am fascinated by Postman’s conception of humanity and our descent into distraction via media and communication technologies I don’t think the comic really represents either Huxley or Postman’s work accurately. The comic implies a passivity in humanity which isn’t present in Postman’s writing, and to equate twitter, facebook and reality TV with some of the mind-numbing social distractions of Huxley’s world is a stretch. While facebook et al., may be argued by some to be ‘mind-numbing social-distractions’, we do not use them and engage with them because we have been sleep-taught by the government to do so. We still retain agency, the ability to choose to engage, something unthinkable in Huxley’s world. I think this is a really important distinction, and while reading Brave New World I found very little, beyond the superficial distractions of the society, which would indicate we are living in ‘Huxley’s World’. 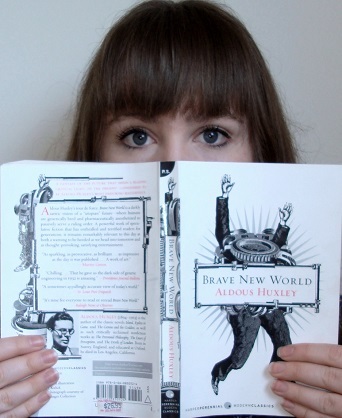 As a closing note, aside from 1984 and Brave New World, some dystopian novels I have read and would recommend are: Fahrenheit 451, A Clockwork Orange, Do Andriods Dream of Electric Sheep, The Forever War and Jennifer Government. (A couple of these probably would also fall into ‘post apocalyptic’).